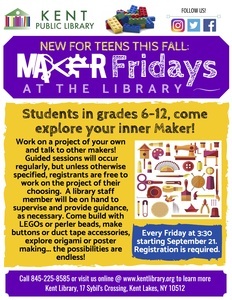 Students in grades 6-12, come explore your inner maker! Work on a project of your own and talk to other makers! Guided sessions will occur regularly, but unless otherwise specified, registrants are free to work on the project of their choosing. A library staff member will be on hand to supervise and provide guidance, as necessary. Come build with LEGOs or perler beads, make buttons or duct tape accessories, explore origami or poster making... the possibilities are endless! Every Friday at 3:30 starting September 21. Registration is required. The Kent Library is located 17 Sybil’s Crossing and can be reached at 225-8585 or www.kentlibrary.org.